Are you in the market for top-notch Pressure Washing Beaumont services that will meet your expectations far beyond your own imagination? If so, then consider contacting Hydro-Clean Services, Inc. Throughout southeast Texas and the state of Louisiana, we are your specialists for your power washing chores and so much more. Hydro-Clean Services, Inc. in conveniently located in Beaumont, TX. Our company began in 1991 under the leadership of Joey Hilliard. We have grown tremendously over the years and have developed a glowing relationship with our previous customers. It would be our pleasure to have the opportunity to add you to our list of loyal patrons and satisfied clients. Pressure washing is just part of our expertise. We also have experience in other types of specialized cleaning. Whether you need assistance cleaning your residential property, commercial property, or industrial property, we are proud to say that we can help you in all of these areas. Furthermore, we are most proud to state that we are a fully insured company with Worker’s Compensation, so our clients can rest easily knowing that we take all precautions necessary when completing each of our jobs. 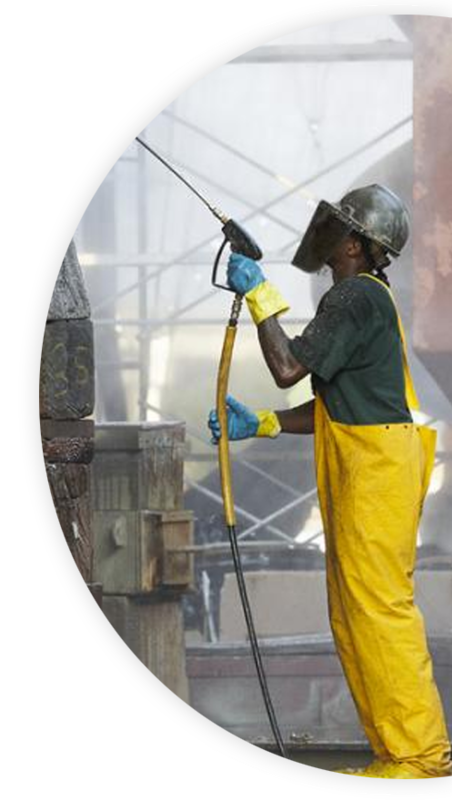 Hydro-Clean Services, Inc. staff members are highly-trained to tackle any concrete cleaning chores that you request of us. It is our commitment to you, our customers, to provide the best possible care and thorough job that we can offer. With advanced equipment, well-trained staff, and lots of experience, you can be sure that you are in good hands with Hydro-Clean Services, Inc. If we may be of service to you, then contact us today. We welcome the chance to visit your location and offer you our free estimates. As always, we guarantee that you’ll be pleased with our services. Perhaps you might like to check out our website, too. Visit us often to view our “deal of the day” that might peak your interest. We look forward to servicing you very soon! Hydro-Clean did a beautiful job on our steeple at St. John’s United Methodist Church! Everyone was very friendly. Thank you Jamie Hendrix! I refer them to my clients and use Hydro-clean all the time. Top notch and the best. My husband and I just had our vinyl siding and concrete cleaned by Hydro-Clean. They do an excellent job!! This is our second year and any of you with vinyl siding or other cleaning jobs need to call……very honest, prompt and reasonable as well!! Great work at a great price done by great people. That is Hydro-Clean!!!! Honest and dependable. If they say they will be there, they are! Highly recommend them to all my friends and family. Hydro-Clean!! All your pressure washing needs right here!! I have over 20 years dealing with this company… When they first started out , they kept my vents in the bakery I managed beyond clean!! and our parking lots stayed in brand new looking condition!! They have continued to provide excellent services to the community for many years!! parking lots, vinyl siding, homes, roof tops, restaurant vents… they are the BEST!!! give them a call today!! Do great work, when they say they will do it at a fair price. Great folks !! !